What follows here is a reverse chronological (i.e. 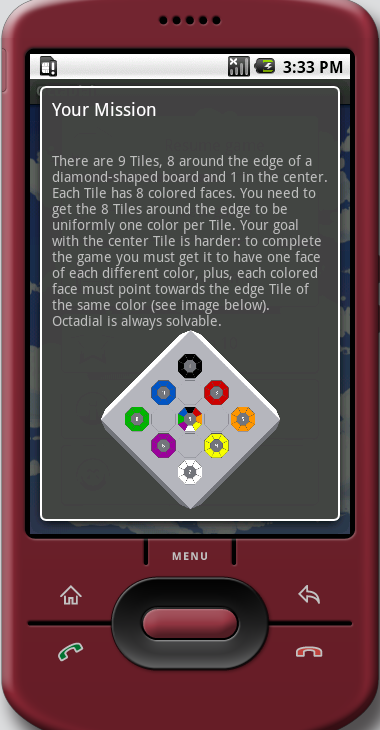 newest to oldest) selection of news and screenshots about various versions of OctaDial down the years, most recently, a version for the crisp new, high resolution, tablets and high-resolution smartphones running Android, that we launched on Google Play Store yesterday, 21st Feb 2013. 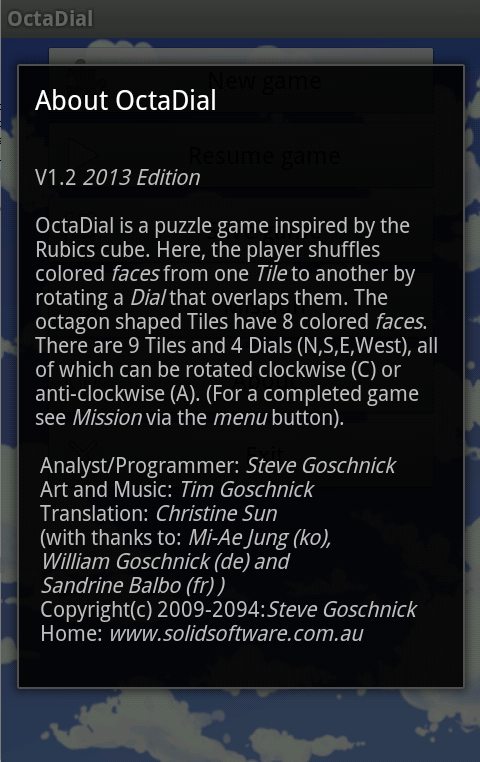 Feb 22, 2013: We have just launched OCTADIAL on the Google Play store. This version has four sets of screen-graphics that the program chooses from optimally for the device it is currently running upon - so you get a great user experience no matter what Android device you are using. When we uploaded it to the Google Play store it reported back, that this version of OCTADIAL supports 2527 devices - that's a lot of variation of hardware out there in userland! For example the screen resolution of the Google NEXUS 7 - a seven inch tablet - is a whopping 1280x800 pixels (that's the same number of pixels as a 13" Mac Book Pro, pre-Retina display). Games do look great on these high resolution tablets - provided that the app developer updates their graphics to the higher resolutions, instead of just doing a lazy scale-up of the old graphics artefacts; or worse, just letting the OS do the scaling for them! We have taken the proper path and updated OCTADIAL with nice crisp high-resolution images for these high-res smartphones and tablets, and appropriately designed smaller graphics for the lesser endowed 'Feature Phones' such as the sub-$100 Android's with just 320x240 pixels to play with. 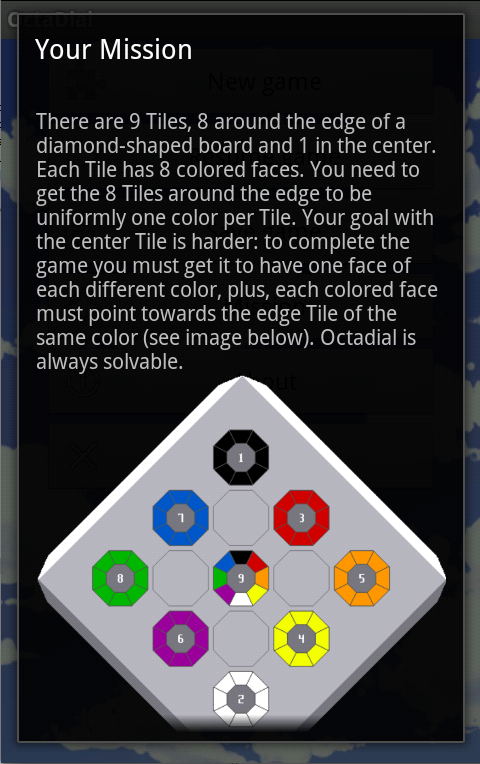 Keep an eye out for OCTADIAL in the Google Play store - its a supreme bargain at around $1. 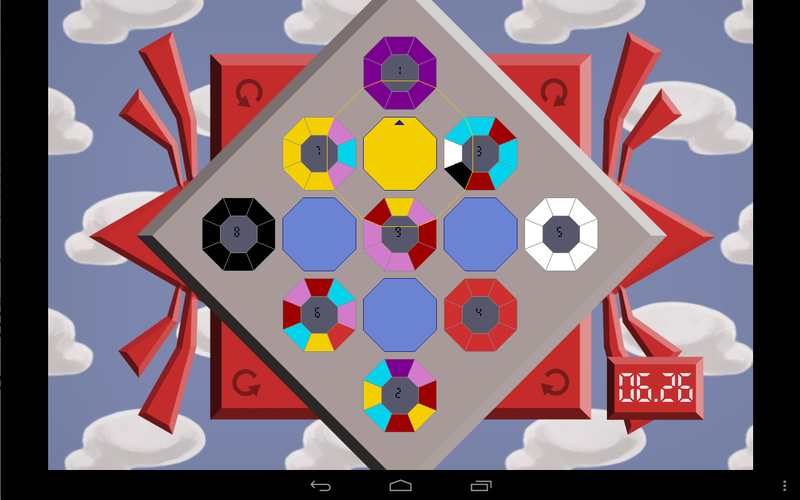 Click here for Google Play store and then Search for OCTADIAL. Any Feedback or User reviews, very much appreciated:) in a very crowded app world. ... with other languages to follow. 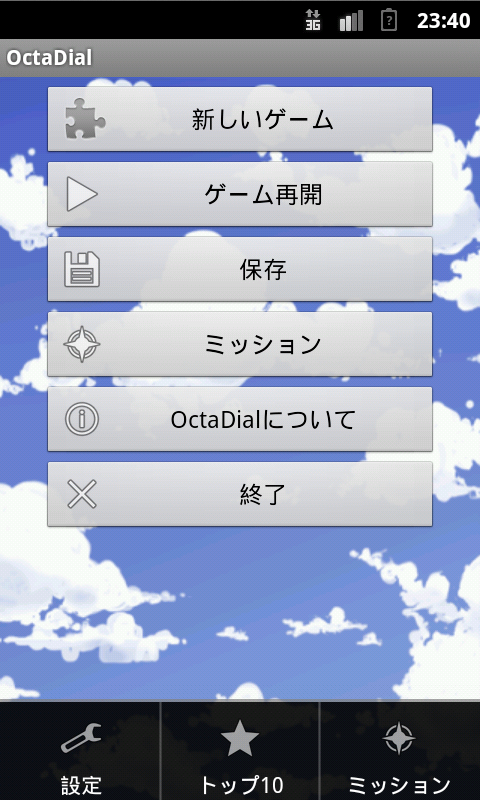 Fig.2 - Menu screen with Settings popped, in the Japanese Localization (L10n). Fig.3 - 'The Mission' screen in the South Korean L10n. Jan 15, 2013: Research In Motion are launching their long anticipated BlackBerry 10 OS (i.e. a new Operating System for BlackBerry smart phones) at the end of this month (30 Jan 2013). 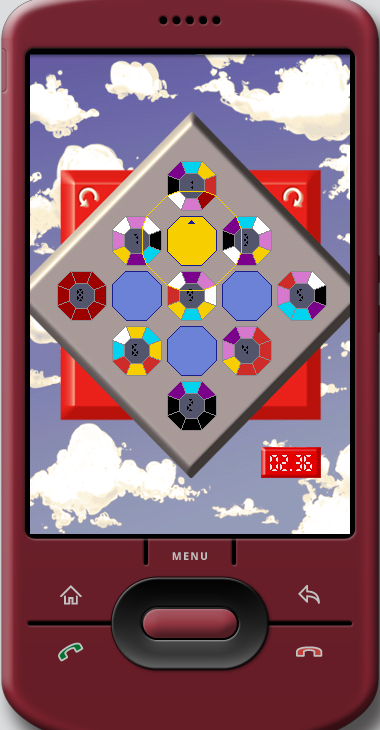 We have had our hands on the pre-release developer model - the Dev Alpha BB10 for some months now - see the image of me playing OctaDial on it below. 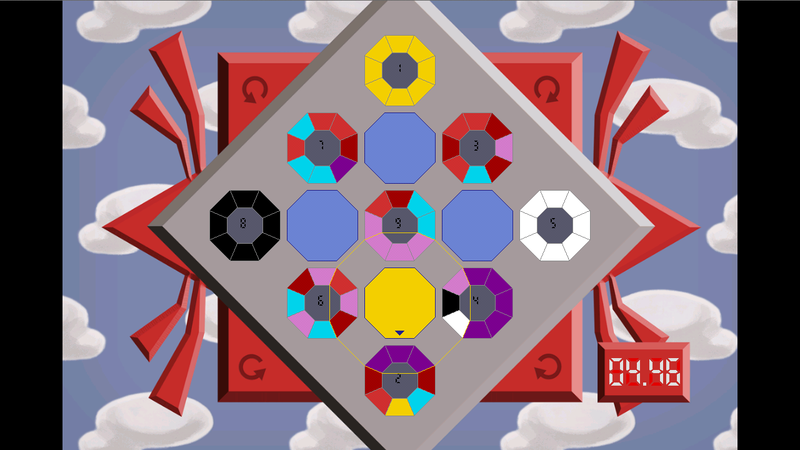 As usual we took my OctaDial game to this new platform first - i.e. its our standard porting-test app, since it uses a lot of aspects of a new OS+device that put it to the test ... the image and vector graphic system; the database/file system (for storing both the current state of the game when you get otherwise interrupted (e.g. a phone call), plus the sorted list of 'Best Game Times' so far achieved; handling multiple screen resolutions and changes in orientation via the acceleration sensor; good use of touch; as a normalised measure of the various markets out there; etc.). The screen resolution of the Dev Alpha BB10 is a whopping 1280x768 pixels - which looks great on a 4" phone - as long as the app developer updates their graphics to the higher resolutions, instead of just doing a lazy scale-up of the old graphics artefacts; or worse, just letting the OS do the scaling for them! Naturally, we didn't take that 'cheap' root but instead have updated the graphics with nice crisp high-resolution images for these high-res smartphones and tablets too (i.e. optimised for 4 sets of resolutions, not just one). Note: RIM plans to release six different models of smartphone running BB10 in 2013 alone. 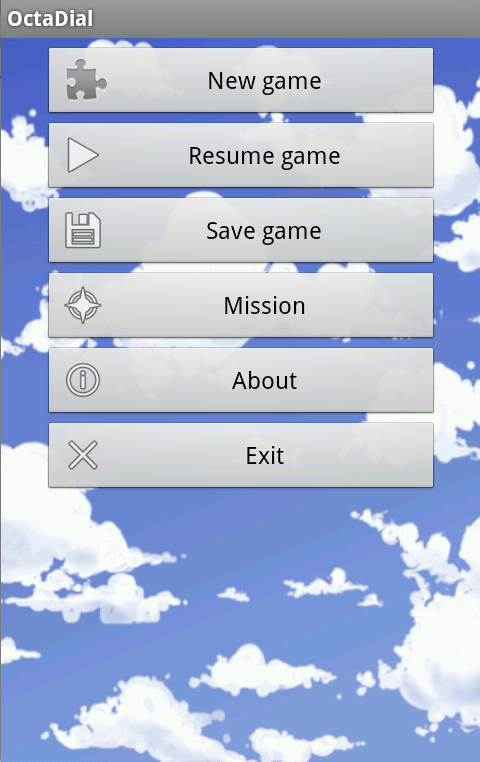 Fig.1 - Opening Menu screen. Fig.2 - Players 'Mission' screen. 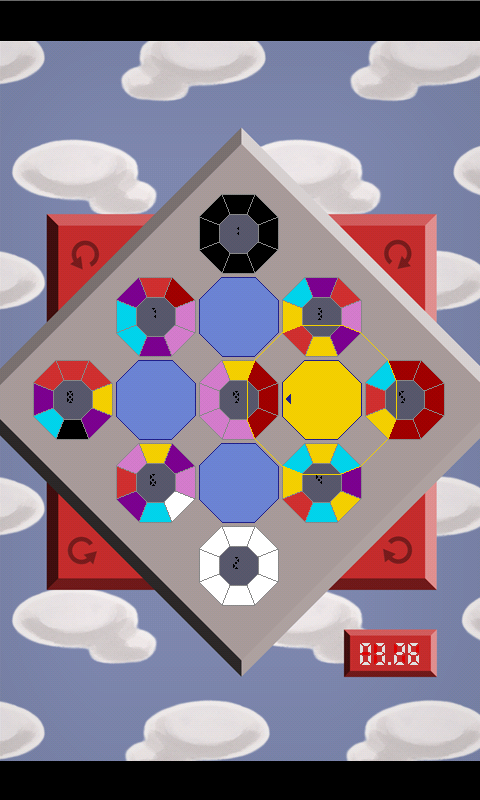 Fig.3 - Starting position with color tile-faces evenly scattered. Fig.4 - A game part-solved. Fig.5 - The 'Settings' Menu selected. 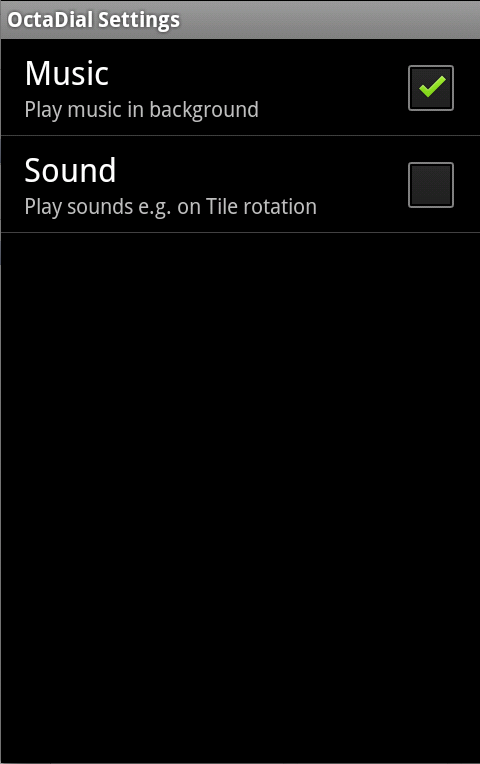 Fig.6 - Music can be turned off/on, as can the rotation 'clicking' sounds. Fig.7 - The 'About' screen on V1.2 of the BB OS 10 version. Yesterday 31st August 2009 at 11.59.59, US Pacific Time, ADC II (Android Developers Challenge) accepted the final submissions. 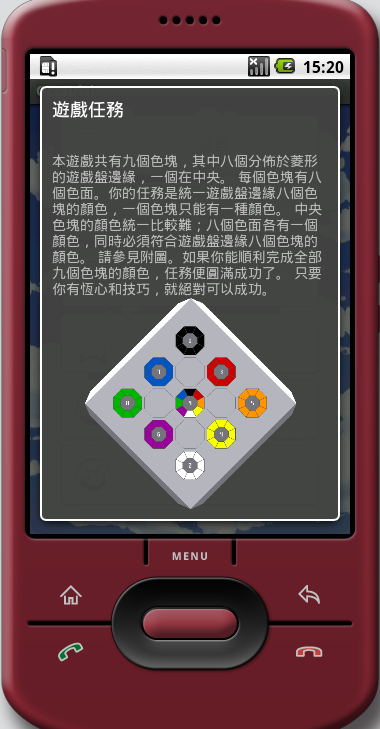 Solid Software got an Android version of OctaDial uploaded just 12 hours before the deadline - but with the feature-set complete and tested on several languages including: English, Traditional Chinese, Simplified Chinese, Korean, Japanese, German and some French and Italian. As you can see in the image of the 'game in motion' below, it is largely devoid of the need to support different languages, particularly on 'Touch' screen- empowered Android phones such as the HTC Magic. 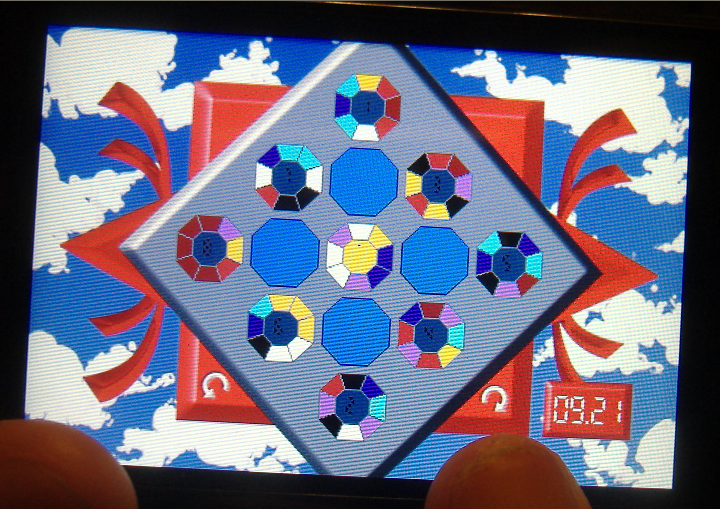 Image 11: OctaDial in landscape mode on a HTC-Magic Android-power phone. 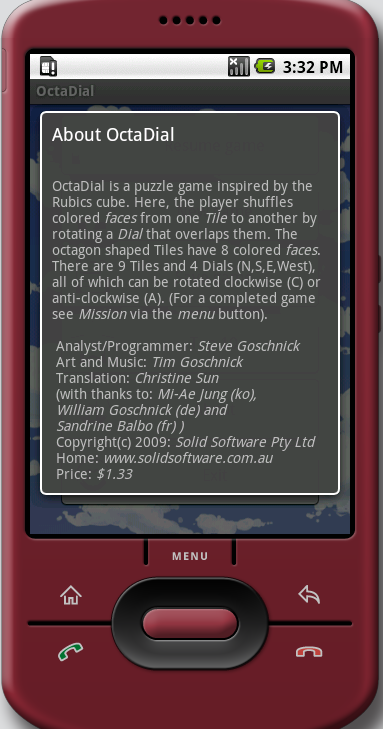 Until this Android smart phone version of OctaDial overviewed above, we hadn't done a version of OctaDial since it was invented here at Solid Software Pty Ltd by Steve Goschnick for MS-DOS computers back in the early 1990s. Its really been waiting for something like the current generation of Smart phones to come along, with the right combination of a decent sized screen and a good pixel resolution. In 1992 a V2 for MS/DOS was published by Dynamo House P/L (Australia). The software package design was by Margaret Leunig (Graphic Artist sister of Michael Leunig, the Australian cartoonist), and screen graphics by early pioneer Computer Artist - Kim Lynch. It was for VGA video-card only PCs, and thereby didn't support multiple screen resolutions (as per the V1 for MS/DOS) - but it did have 3 modes: moving tiles, fixed tiles and 3D tiles. 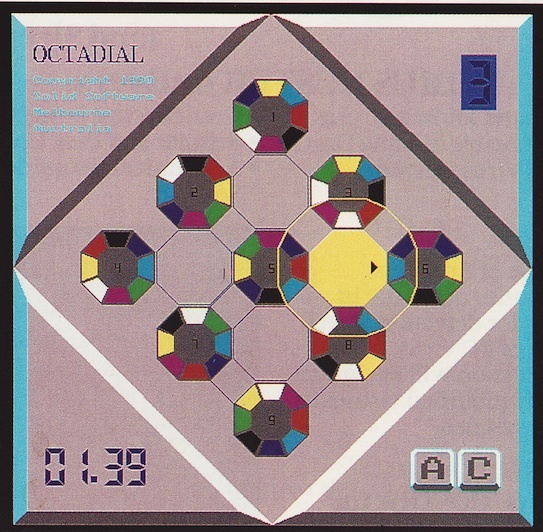 In 1990 the very first version of Octadial was developed and self-published by Steve Goschnick for Solid Software. V1 was less sophisticated artistically than V2, but more sophisticated technically. V1 was totally scalable (really just a big dynamic equation of several thousand lines of C++, including the definitions of the board and bevelled edges) and ran on a multitude of PC graphics video cards of the day including VGA, EGA and even the low resolution CGA color graphics adapter (eerily reminiscent of todays very high, high and low resolution Android phones). Fig. 2: Screen image of Octadial V1 for MS/DOS, circ. 1990. Fig. 3: Visual diary entry playing with tile patterns that led to Octadial, circ. 1990. We don't retain any data about customers who bought OCTADIAL through the App Stores by which it is currently available (at the present time just two such stores: 'Google Play'; and 'BlackBerry World'). What details Google Inc collect and what details Blackberry Inc collect, and what they do with them, is none of our business - you will have to refer to their Privacy Policies in that regard if it concerns you. If you write to us by email about OctaDial, then naturally we will have your email address (and emails), thereafter. We don't pass on the email addresses of our customers (nor their emails) to anyone outside of Solid Software Pty Ltd. In-house, such an obtained email address will only be used to either: response to your original enquiry/suggestion; or, let you know about relevant new information about our apps, from time-to-time. Customers who bought OCTADIAL prior to the existence of App Stores (e.g. our earlier MS-DOS version), will be represented in our client database. We do not pass on any information from our client database to any other organization or persons. The computers that run our client database, are in-house and are never connected to the Internet by either wire or wirelessly (no kidding). This page last updated: November, 2013. © 1996-2013: Solid Software Pty Ltd. All rights reserved.